"In next three years metering will go smart prepaid, and gone will be the days of bills reaching your house. So need of the hour is to scale up manufacturing of smart prepaid meters and to bring down their prices. "said Shri R K Singh, Minister of State(IC) for Power and New & Renewable Energy. Shri Singh was addressing a meeting of meter manufacturers called bythe Power Ministry here, today.The Power Minister advised the manufacturers to scale up the manufacturing of smart prepaid meters as the demand would be huge in coming years. The Minister also advised the officials of the Ministry to consider making smart prepaid meters mandatory after a particular date.This will revolutionise the power sector by way of reduced AT&C losses, better health of DISCOMs, incentivisation ofenergy conservation and ease of bill payments etc. 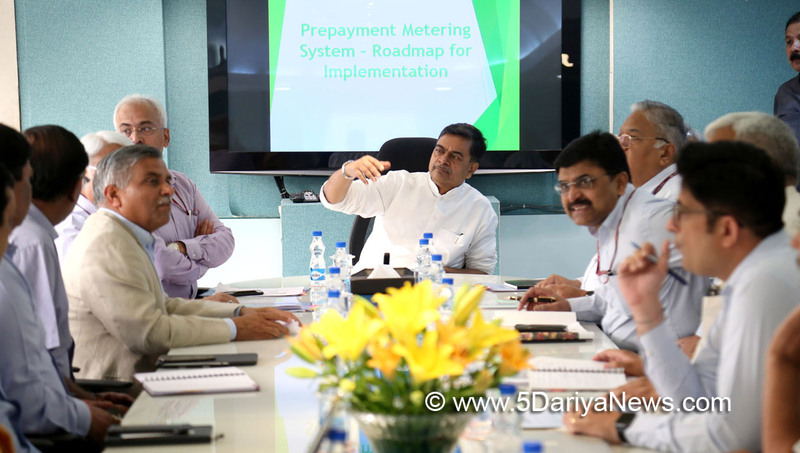 Further, it will generate skilled employment for the youth.The meeting discussed various aspects of smart meters e.g. BIS certification, compatibility with RF/GPRS, harmonisation with existing digital infrastructure etc. It was also agreed that all technical aspects will be further deliberated into in consultation with meter manufacturers, DISCOMs and system integrators.ShriAK Bhalla, Secretary, Power;ShriSanjivNandanSahai, Additional Secretary;ShriArun Kumar Verma, Joint Secretary, Ministry of Powerwere among the officials present from the Central Electricity Authority, PFC, REC, EESL and meter manufacturers.